Over twenty-four hours have passed since the passing away of my father Mr. Yunus S. Kagalwala. A life-time of memories is impossible to capture in a blog post, and for the past several hours, images of him as a parent flash before my inner eye. I have mixed feelings for him, for he was a terror as a father to young children. He often resorted to corporal punishment to make my brother and me toe the line. He was singularly unfortunate in financial matters, and hence, even as a teenager, I was able to understand his angst. I still remember him handing us a single 10 paisa coin every day as we (my brother Kaizar and I) set off for school, ostensibly to purchase our bus tickets. In reality, I used to walk the entire stretch to school (about a km and a half) and use the money to buy stuff that is normally proscribed and hence, much sought after, e.g. jiragoli, spinning toys, black and white zebra golis, saunf embellished with colourful coverings of sugar, etc. 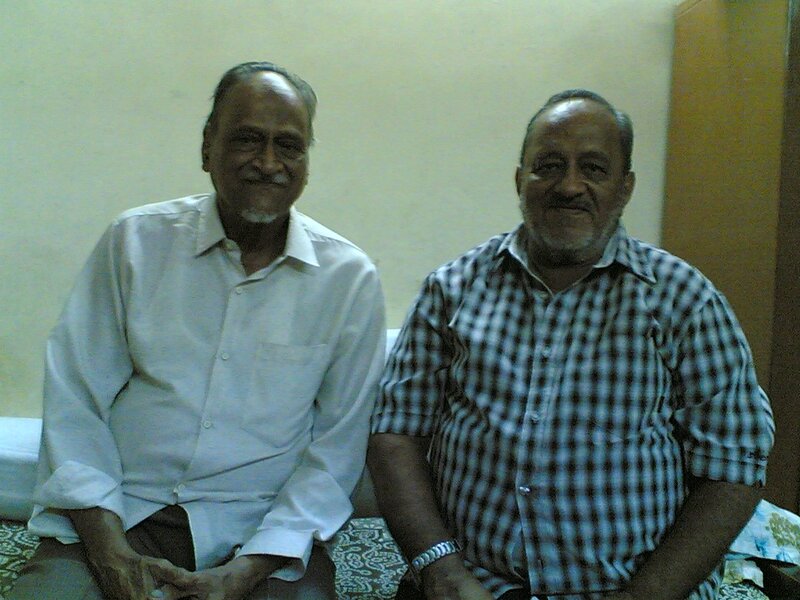 Dad (left) with his youngest brother Idris ... an old picture. His was a method of discipline that brooked no nonsense, but mostly, I steered clear of his hands, as I was more into indoors, reading, studying, etc. Moreover, I was not a very picky eater, and ate whatever was made. My mother passed away when I was about 11 years old, and my dad re-married a cousin sister of my mom, Shirin Savliwala, and it is she who brought us up for the last 40 plus years. Considering the circumstances, my dad and she did a great job of making me a qualified Pediatrician, and settling both my younger brothers after getting them properly educated. For this I will be ever grateful, and would like to appreciate his steadfastness in making us what we are today. Over the years, he mellowed and began to be a little less belligerent and more compromising in his attitudes, but he continued to enjoy life - his hobbies being addiction to radio music in the pre-television days, and then, the idiot box - with its countless forms of musical, sport and news-related entertainment. Besides all this, was his love for the written word. He preserved old newspapers as if they were treasure, and it was only in the last few months after he became seriously ill that he gave up on these, and gave us a chance to throw away these - some of them as old as from the late 1940s. I guess I have some of his habit in me, as I do tend to preserve interesting cuttings from printed matter. Also, he used to sketch very well, and write too. I have come across his scrap book in which there were several hand-drawings and essays on diverse topics such as "If I were the Prime Minister ..." to "Autobiography of ..." etc. I guess I got his sketching and writing genes too! My dad's tastes were simple, but he enjoyed travelling. In the year 2011, at my initiation, our entire family went to Alibaug for two days, and, at least for me, these were the best two days of our family for as long as I can remember. We were present in full, i.e. my parents, all three of us brothers and our entire families. Photos of this outing can be seen on my Facebook profile (Taher Kagalwala). Earlier, I don't think we went out much, but I have pleasant memories of us going to a couple of places, viz. Mahad, and Mahableshwar. While the Mahableshwar trip was in the eighties, the Mahad trip was in the nineties, and he had a great time at both these places. My only regret will be that I could not send him for Umrah or Hajj due to the lack of opportunities and also because he was not too keen to go. In the end, I performed Umrah for him (i.e. in his name) a few months ago, and prayed to Allah to send him the blessings for the same. I will miss him, and for sure, my mom will. May his soul rest in peace till the Day of Judgement, and may Allah grant him a place in Heaven thereafter. Amen. Your memories I can very well relate to as I was a part of Kaizar's friend circle and many times would visit your home in Sattad, I have quite some memories to remember and cherish of my childhood days with Kaizar and also whenever I have met you and your parents. You have laid your heart bare and recaptured your memories beautifully. May his soul rest in eternal peace, God bless you and your family. May Allah rest his soul in peace. Your deep pain is obvious and the words brought tears to my eyes.May Allah bless all your family and help you to pass over this hard time.